A house must be built to safely resist the lateral loads that result from high-wind events and earthquakes. Wall studs alone can't resist the racking forces. Wall bracing helps keep walls square during wind and earthquakes. Understanding the IRC (International Residential Code) wall bracing requirements can be a challenge, but following them is of critical importance to a home's structural integrity. While wall bracing is one of the most important structural elements of any house, it can also be one of the most confusing. The International Residential Code (IRC) defines 16 bracing methods and defines minimum widths for wall bracing segments based on the construction material and type of bracing method. Keep it simple with fully sheathed wood panel walls. Fully sheathing a house is an easy and effective solution because wood structural panel sheathing is the only IRC-approved way to reduce the width of bracing segments to as little as 16 inches. The load from gravity is easy to understand and constant on every house. Lateral loads are just as constant, but they vary in force and are not as recognized. The most common and universal lateral load is wind, with design velocities that vary from 85 to 150 miles per hour across the United States. The strongest wind loads, tornados, are not predictable and randomly occur in every part of the country. While it is not affordable or reasonable to design structures to withstand the strongest tornados, experience has taught us how structures can be designed and built to resist wind speeds of up to 150 mph and protect not only the inhabitants but also the integrity of the structure. Similar experiences with seismic activity have also helped us learn how to design and build structures to better withstand earthquake forces. When applied per building code requirements, prescriptive lateral wall bracing provisions help structures resist the lateral loads that result from wind and seismic events. Fully sheathing with wood structural panels results in a rigid, boxlike structure with strong, resilient, IRC-compliant walls. This short introduction to wall bracing with wood structural panels covers key wall bracing principles using real-world examples from the reconstruction of Washington, IL, after the devastating 2013 tornadoes. 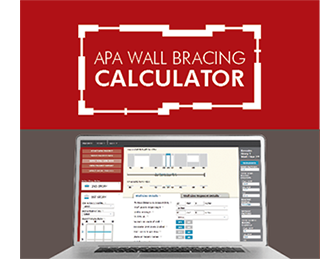 The Wall Bracing Webinar series is presented by APA and AIBD (American Institute of Building Design). The five-part series begins with a one-hour introductory session covering wall bracing history, theory and strategy. Additional sessions address related topics, including meeting code requirements with wall bracing, the simplified wall bracing method and bracing for higher seismic and wind zones. Input a project and generate a convenient printed report that demonstrates IRC-compliant wall bracing in a clear, visual format. APA's Simplified Wall Bracing Method, an enhanced variation on the 2012 IRC simplified wall bracing provisions (Section R602.12), gives builders an affordable, streamlined approach to meeting wall bracing requirements that can be used for select single-family construction designs in certain regions.